The Ethics Commission of the Russian Lower House is ready to ask three deputies to surrender their mandates as they were noticed at a recent opposition march that ended in clashes with law enforcers. Head of the commission and a member of the parliamentary majority United Russia, Vladimir Pekhtin said that three members of the Fair Russia faction – Ilya Ponomaryov, Gennady Gudkov and Dmitry Gudkov – should not evade responsibility for events where ordinary citizens got hurt. Pekhtin said that he had received complaints from Sergey Zheleznyak, also a United Russia member and deputy State Duma chairman for this party’s faction. 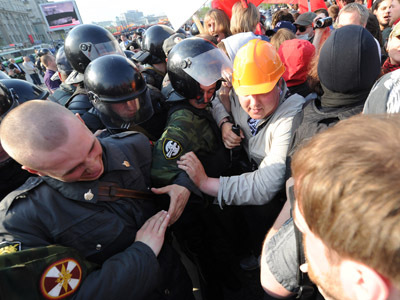 Zheleznyak claims that the three deputies did not help law enforcers prevent clashes and injuries, but, on the contrary, contributed to the rise of tension. The deputy called his colleagues’ behavior “especially cynical” and said that “such behavior from deputies who actively use their parliamentary powers against the law and order is not appropriate for parliamentarians and incompatible with the status of State Duma deputies, if these facts get confirmation”. The head of the Ethics Commission said that the three deputies’ case will be considered at a special session on June 20. The commission suggested that the deputies submit a written explanation before this date and that the Fair Russia faction give an official appraisal of the facts. 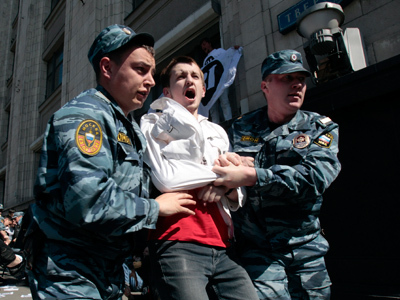 “If they participate in rallies, call for protests that lead to violation of public order, then they must bear responsibility as ordinary citizens, not hide behind their parliamentary immunity,” Pekhtin said. The deputy added, however, that he and the commission are not seeking to oust the three MPs from the State Duma and that, in his opinion, all three would remain in the parliament even after the scandal. 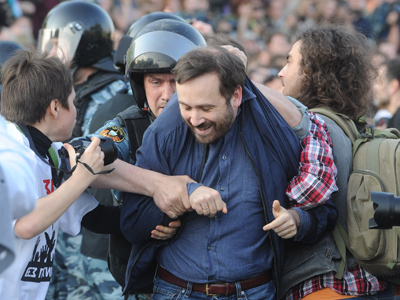 Father and son Gudkovs and Ilya Ponomaryov took part in the last March of Millions protest rally held in Moscow on May 6 – one day before Vladimir Putin’s presidential inauguration. The protests were licensed by authorities, but in the middle of the rally some radicals started clashes with police and officers dissolved the crowd, detaining about 400 people. 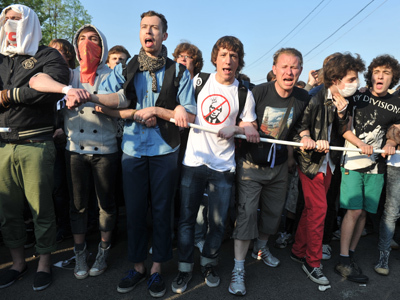 The Investigation Committee started a criminal case into the mass riot and detained seven people who are suspected of organizing the unrest and assaulting police – all seven now face criminal charges.